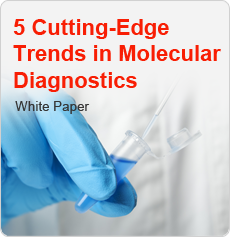 Molecular diagnostics is one of the fastest growth segments in clinical diagnostics. Molecular tests are used in just about every facet of laboratory medicine: infectious diseases, inherited diseases, cancer, and more. In the past few years, the market has experienced rapid change with new trends emerging in the industry. Fill out the form to gain valuable information on the world market for molecular diagnostics.